The most interesting homes are those that are designed with innovation in mind. Those where out-of-the-box style reigns. That's the kind of design that you see in the work of Loczi Design Group. The San Francisco-based firm is known for creating one-of-a-kind spaces. And this modern San Francisco home in SOMA is no different. Formerly two separate units that were merged together to create one home, Loczi Design Group had one mission for this interior - to design a space where there client could entertain and throw large or small gatherings with ease. The interior design project was the perfect complement to the home's unique architecture. A twelve-foot skylight and a striking steel staircase meet you at the center of the home. 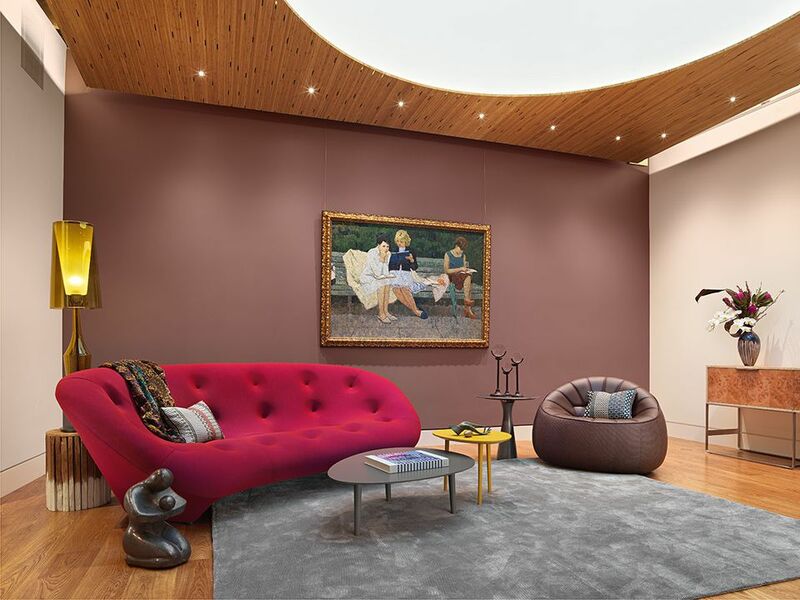 Flanked by the client's collection of mid-century Russian art, the interior design took direction from all of the architectural elements in this eclectic interior. Unconventional, funky, and with a love of geometrics, Loczi Design Group was able to put their stamp on the newly designed space. Just as their client asked, spaces were designed with entertaining in mind. In this lounge, low-seating was placed beneath a skylight. The perfect place for party-goers to enjoy a cocktail, and even a look up at the stars and moon when the sun sets. And just like in the home's living room, the lounge is home to a fun mix of hues. Turquoise seating and a subtle shade of lilac on the wall form a striking color palette, a perfect reflection of the colorful art on the wall. Beyond the lounge area, this contemporary dining room can easily seat eight. The furniture is so sleek and sophisticated. Perfect for an evening of entertaining in the Bay Area. Beyond the stone table, it's the art that catches the eye in this dining room. Alcoves are the perfect fit for abstract pieces that add to the home's rich color palette. Fuchsia, lilac, soft blues and the greens that are in each piece literally jump off the canvas and onto the furnishings in the living room that's home to a hot pink sofa and purple side chairs. Just beyond the dining room, the kitchen completes the color story of this open plan living area. For an unexpected touch, brightly-hued kitchen cabinets have been brought into the mix. From top to bottom, modern white cabinets shine in cool contrast to the rich, raspberry cabinets below. Silver finishes complete the modern aesthetic. At the bar, chairs in a mix of cool gray and wood tones add an Asian feel to the space. With the addition of bar stools, the kitchen is now an eat-in space, where guests get a front row seat to the preparation of the evening's meal. The bathroom has been designed with luxury in mind, sporting unique finishes, shapes and cool tile. While the rest of the home has a cool palette, the bathroom is home to warm shades of brown, cream, and shimmering brass. The double vanities have been constructed of a warm bent wood. The shape is reminiscent of waves of water. On the walls that flank the opening to the soaking tub, tile is the perfect complement to the mix of warm tones. The finishing touch - brass sconces that look as if they are small sculptures, lighting up this luxurious bathroom. A step inside to the soaking tub, and a crisp, clean white room has been designed to be a relaxing retreat. The skylight shines on custom tile that has been used to create a statement. In shades of blue and gold, this design is also reminiscent of waves. This bathroom literally offers the lap of luxury. It's one more striking space in an interior designed with style in mind. True to the aesthetic of Loczi Design Group this gorgeous home is a little bit funky, totally unconventional, and absolutely striking. A colorful San Francisco abode just perfect for entertaining.